Party political advertisements dominated the front pages of several local newspapers yesterday as readers prepared to go to the polls in local elections. The wraparounds promoting the Conservative Party appeared on the fronts of weekly titles including the Mansfield Chad, Stockport Express and Rhyl, Prestatyn & Abergele Journal. The advert advocates voting for the Tories in the forthcoming General Election on 8 June, with particular focus on current Prime Minister Theresa May. However, voters in Mansfield, Rhyl and Stockport also go to the polls in elections for Nottinghamshire County Council, Denbighshire County Council and the directly-elected mayor of Greater Manchester respectively today. Trinity Mirror, publisher of the Stockport Express, said the wraps will appear on nine of its titles over the course of this week. HTFP has also asked Johnston Press, which owns the Chad, for a comment on the wraps. The adverts were picked up on by Channel 4 News political correspondent Michael Crick, who asked his followers on Twitter to send him examples of other local newspapers giving over their front pages to party political messages. Michael posted: “These wraparounds over four pages are clever way of getting local newspapers to deliver election leaflets, especially when short of activists. 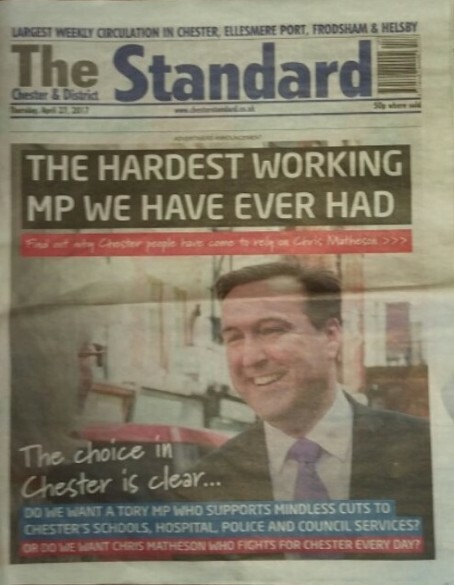 One of the examples sent in to Michael was last week’s Chester Standard front page, which was given over to an advertisement for Labour’s sitting City of Chester MP Chris Mathieson. HTFP has also asked NWM Media, owner of both the Standard and the Rhyl, Prestatyn and Abergele Journal, for a comment. The hompeage of the Bath Chronicle’s website also features a wraparound advert for local Tory MP Ben Howlett. Similar adverts promoting the Conservatives appeared on the front pages of several weeklies covering marginal areas in the tun up to the 2015 General Election – including the Lancaster Guardian, Lincolnshire Echo, Eastbourne Herald and Hastings & St Leonards Observer. The decision to publish led the Herald and the Observer, both owned by JP, to pledge a “full review” of their advertising policies after more than 1,200 campaigners called on the latter to apologise for “prostituting” its front page. The whole issue of political party wraps around local paoers sums up how all regional press publishers are no longer driven by providing an essential hyper local news service for and about the communities on their patch anymore just simply bottom line commercialism at any price and prices yet again that an editor now has less clout than an ad Rep.
Not only do they devalue their entire publication by accepting these propaganda cover, they also risk losing even more readers who are not on the side of the party advertising in this way. It would be interesting to see if these are all sold at the same rate?, whether it’s an auction with the rep ‘doing a deal mate’ to flog one at any cost to hit a target ? Whether all parties are offered the option of wrapping?or whether the rate depends on which party is favoured by the publisher? In my view they should not be allowed to carry them for any party, but when money’s the motivator which it clearly is , anything goes. The actions of a bankrupt industry, in every sense. I find this utterly depressing and it can do nothing but harm to already under pressure circulation figures. No matter how hard the papers try to highlight that these are ads (and in the case of the Chester paper they clearly haven’t even tried at all) we all know that a casual buyer who doesn’t agree with the party featured will utter ‘there is no way I am buying that Labour/Tory rag’ and will walk away perhaps never to return. 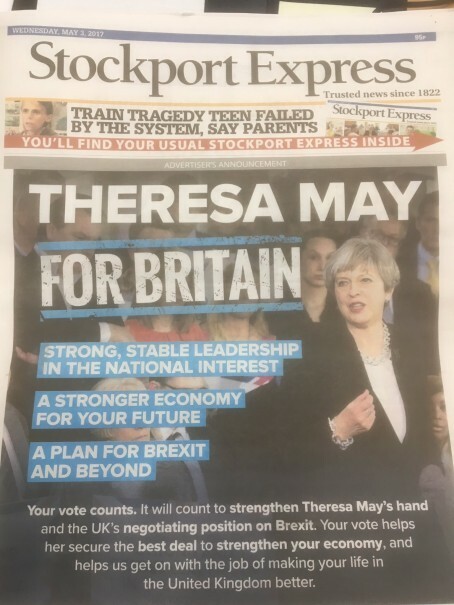 Incidentally, I was impressed by the slogan Theresa May used on the Stockport title about ‘strong, stable leadership’. That’s a new one on me – I think it might catch on for her. I really can’t see anything wrong with political parties advertising in local/regional newspapers. Any reader who thinks the newspaper supports whatever party is advertising in it must be naive. Local papers need the money to survive AND to pay for their editorial staff as well as those that sell advertising. I ran a 4 page wrap in my newspaper last year for UKIP, promoting Brexit. Since then we have run ads for the Conservatives and UKIP inside the paper on a regular basis. We also write impartial editorials and features on all local political groups. Appalling misjudgement – and undermines any claim to hold local MPs and councillors to account. And we have a Conservative MP! It’s stupidity and grabbing the short-term cash really. Probably because they know the short-term is the only term there is. No proper editors in situ these days to say no to it. I give up in despair. By all means accept ads from political parties but not a front page wrap around. A front page is supposed to be about news or have I been naive for the last 50 years since I started in journalism. The vast majority will not see it as an ad immediately and I bet that there will be those who will take one look at the ad-front and refuse to buy it because they think the paper is over-biased in favour of a party they (the buyer) does not support. It also indicates, rightly or wrongly, that editors are being pushed around by the money/ad boys and girls. Maurice Kendrick sees nothing wrong with political wraps as ‘they pay the wages ‘ which is true, however to sell your soul by being desperate enough to have to grab any money going despite how this will appear to readers is a sorry state to find yourselves in IMHO. If the reps sold more retail and classified ads to local businesses,assuming the paper is valued enough to be an attractive proposition to appeal to said businesses, there would be less need to take this type of blatant propaganda.and sorry to say but a large proportion of readers WILL see the paper coming out on the side of the party paying to be featured. If the paper is that desperate for the revenue why not run the four pages in paper with a clear folio piece stating boldly it’s an advertisement, at least it won’t be seen to have hijacked the prime covers of the paper. In tough times it’s easy to justify compromising the papers credibility for cold hard cash. Young reporters should realise what a pitiful job journalism has become as stunts like this are pulled. But in the current cruel climate it is marginally better than the sack, looking at it from a cash point of view. Agree with all the points on here about soul selling as this is the last straw in selling your paper to anyone prepared to pay a price, proving yet again there are no real editors in the industry anymore or certainly not ones prepared to make a stand against such blatant commercialism. yes money’s needed desperately to cover excessive overheads and out of control costs, yes the industry is managing decline following years of mis management and yes ad revenues are at all time lows while ad teams continued to grow out of all proportion to the revenues they’re bringing in but by allowing party political messages to take over the four prime cover pages whilst still carrying the title masthead is sign enough that those papers have lost all credibility Ruth their local communities. As for MrKendricks “..I really can’t see anything wrong with political parties advertising in local/regional newspapers..” quote, neither can I when the emphasis is on the word IN not ON the paper. @Maurice Kendrick – Check out the reaction on social media then. There were days when editors would have said” take a walk” to anyone suggesting a political ad masquerading as the front page. Not any more. They don’t seem to have the power they used to have and should still have. Money talks. I forgot to add that it is not new. I remember working for a magazine when a full page advert or “advertorial” appeared looking like a news page. The 60-strong editorial team sent a robust memo objecting about the masquerade to the managing director. He was apoplectic with rage – but it never happened again. The two NWN Media papers are free weeklies, so I presume that it’s not likely to hit their circulation figures too much.